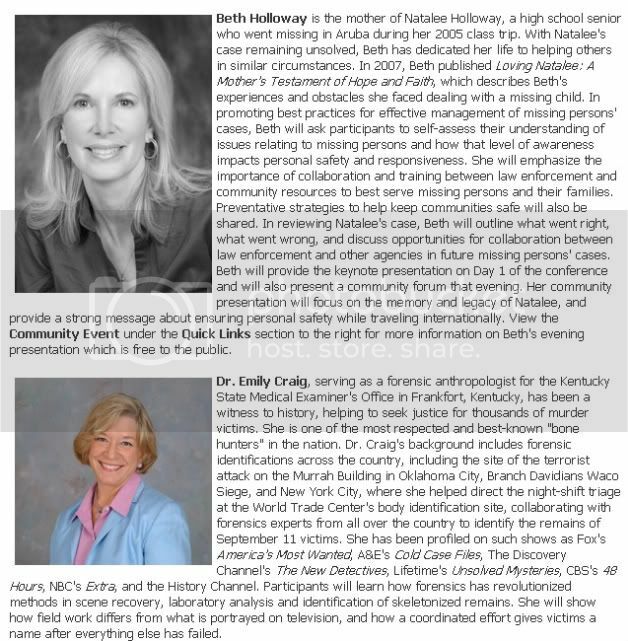 Included among the schedule of diverse and experienced speakers at this national conference are Beth Holloway, mother of missing Natalee Holloway; Dr. Emily Craig, Forensic Anthropologist for the Kentucky State Medical Examiner's Office; Sgt. 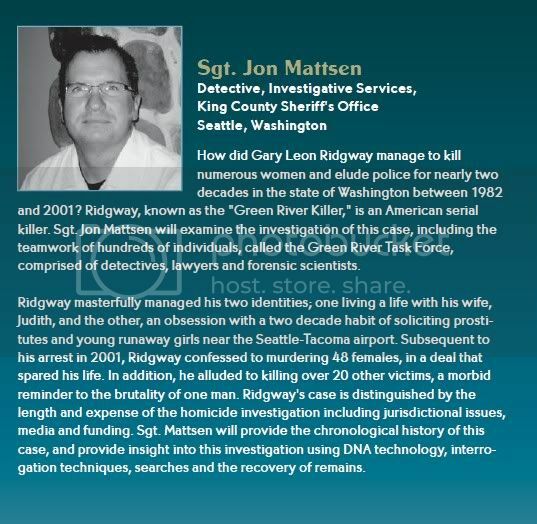 Jon Mattsen, Detective for Investigative Services at the King County Sheriff's Office in Seattle, Washington; and Dr. Daniel & Gil Harrington, parents of Morgan Harrington. Read these speakers' full biographies below or view the Draft Agenda under the Quick Links section to the right for more topics and scheduled speakers. 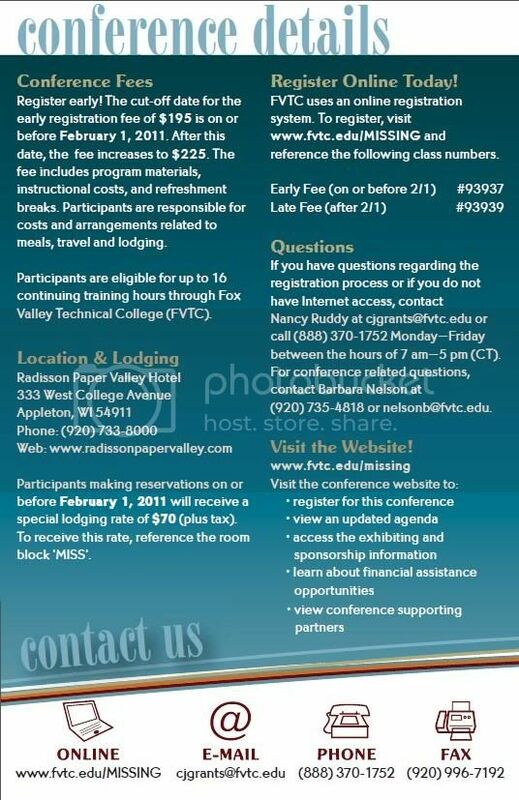 I'm not sure if I was reading it right but it sounds like there is something going on at the Fox Valley Tech College AND at the Radisson Paper Valley Hotel.... both in Appleton, Wisconsin. If anyone lives in that area, this sounds very interesting. 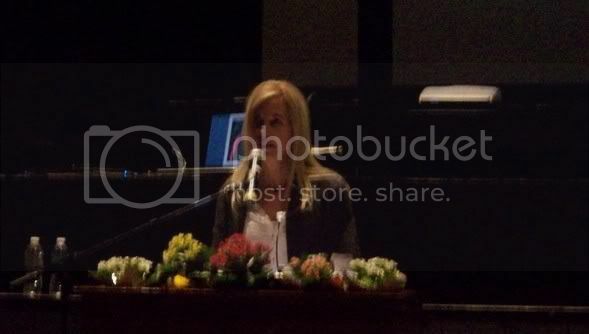 Blonde, thanks for posting that info! I'm working on bringing the brochure over, may take a little while. That poor guy! To have the media and fans comparing him to Joran is horrible. Agenda times and content are subject to change. 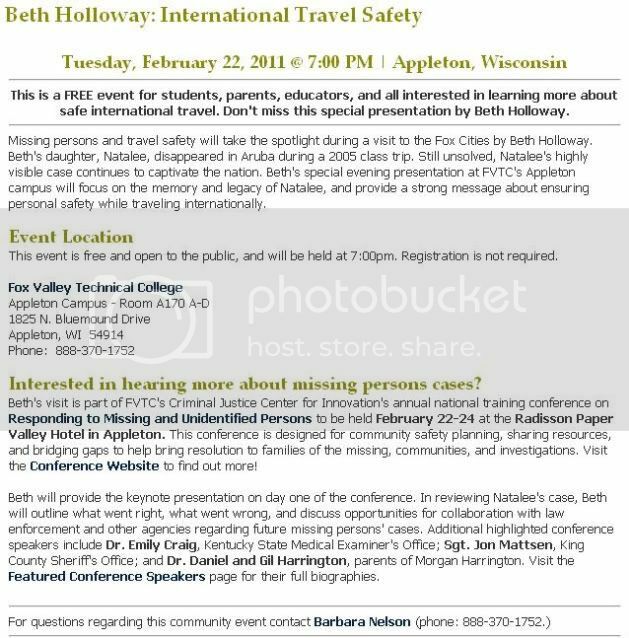 Beth Holloway’s presentation will focus on the memory and legacy of Natalee, with a strong message on lessons learned in personal safety when traveling internationally. tools to use and access. 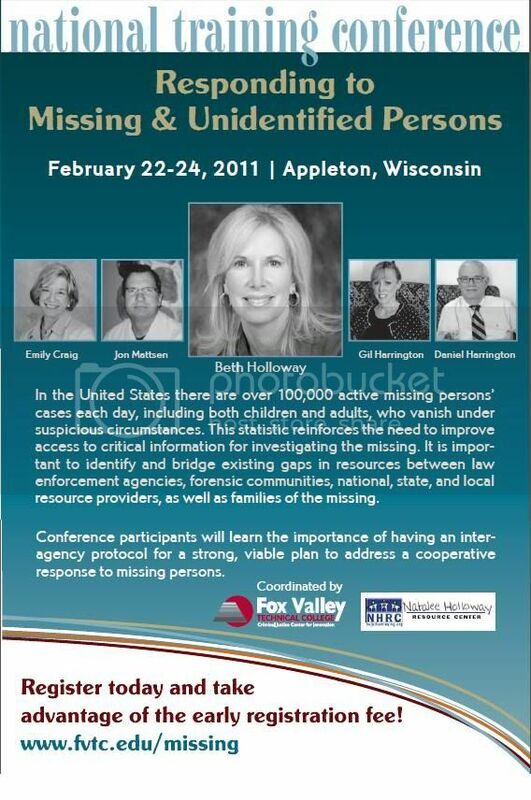 missing persons over the last several years. 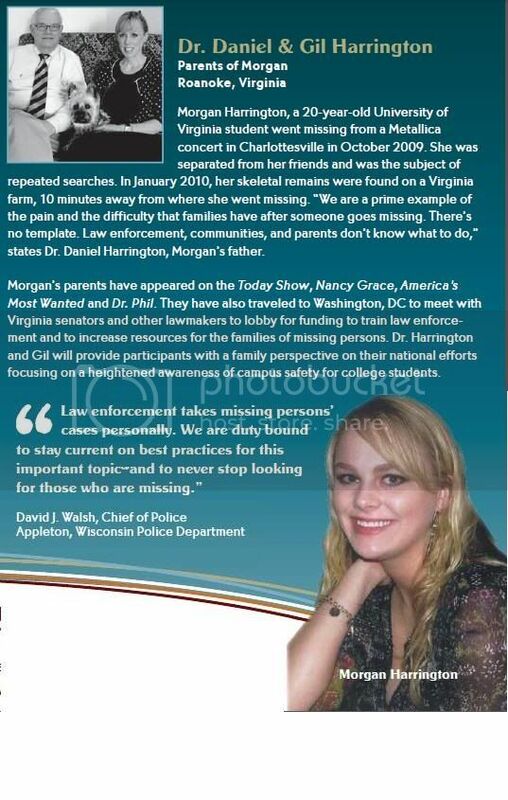 families of the missing is the most valuable. 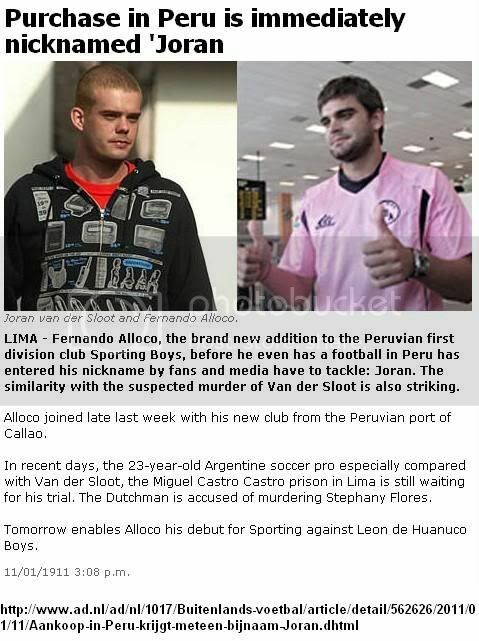 I also figure Joran is letting his hair grow some more and trying to get his hands on a "pink" SBA jersey! That will be his next escape plan. 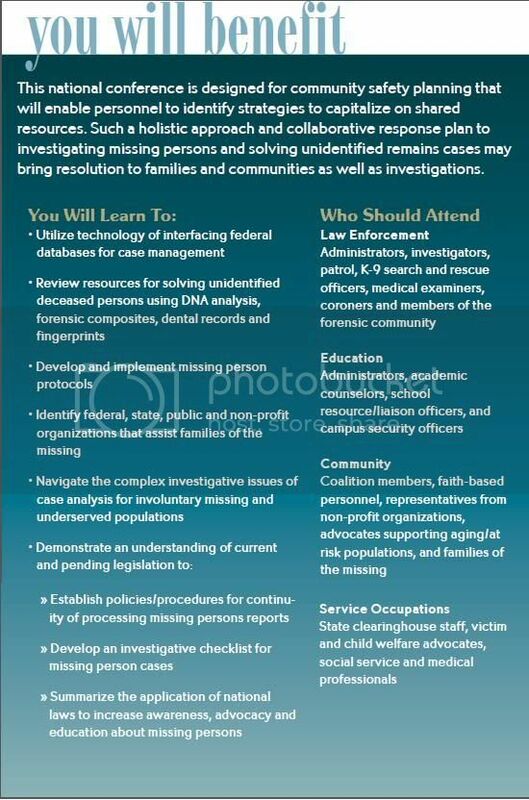 The annual Responding to Missing & Unidentified Persons National Conference has proven to be an invaluable training opportunity for law enforcement, state clearinghouse staff, forensic personnel, families of the missing, and others involved in investigating missing persons and solving unidentified remains cases. Unfortunately many organizations have limited funds allocated for training events and key personnel are unable to attend. Based on numerous requests from past conference participants, the Responding to Missing Persons National Training Conference Financial Assistance Fund has been established. Donations made to this fund will assist those who would not otherwise be able to attend the conference by covering registration fees, lodging, and/or travel costs. Would you like to honor a missing loved one or pay tribute to someone who has passed on? 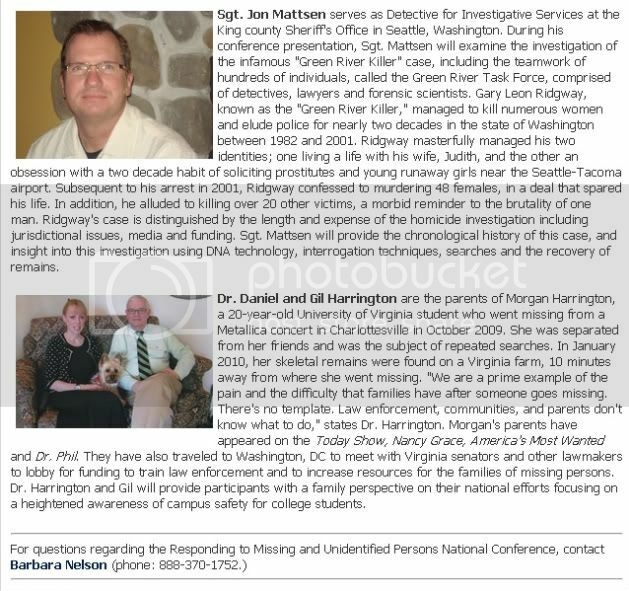 Your support and generosity will continue to make a profound impact on achieving the conference goals to educate participants regarding the protocols for responding to missing persons and solving unidentified remains cases. Donations may be made in any amount. You have the opportunity to specify the type(s) of attendee(s) you would like to be awarded with your funding, as well as to contribute in honor/memory of an individual. For more information regarding sponsorship, contact Fox Valley Technical College toll free at (888) 370-1752 or submit a Financial Assistance Sponsorship Form by Monday, January 31, 2011. 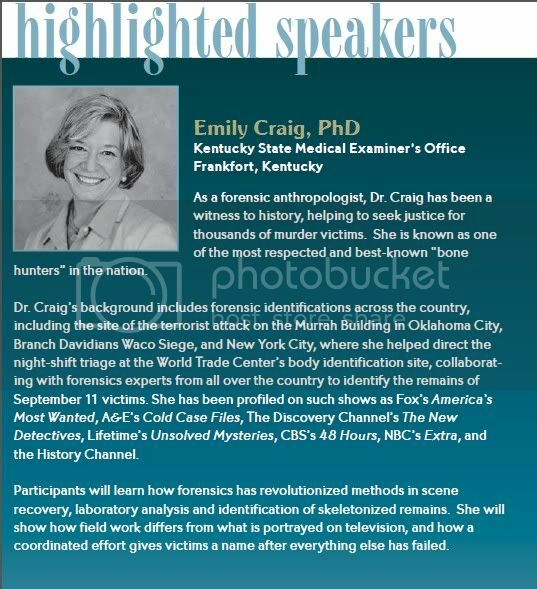 The Office for Victims of Crime Training and Technical Assistance Center (OVC/TTAC) has awarded funding to FVTC to assist family members of missing persons that would like to attend the 2011 conference. Your involvement in the conference is key to sustaining this important collaborative training opportunity. For more information regarding financial assistance eligibility and criteria, contact Fox Valley Technical College toll free at (888) 370-1752 or submit a Financial Assistance Request Form by Friday, December 31, 2010. Beth is on a 40 year mission. If Aruba thinks for one minute the the fortitude of Beth Holloway will fade with time ... think again. This amazing woman ... this determined mother ... is on a 40 year mission. 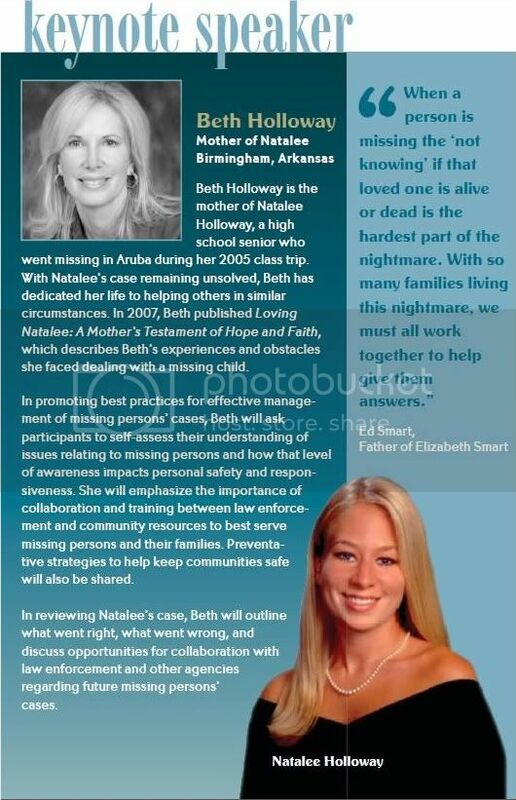 BETH HOLLOWAY TWITTY, MOTHER OF NATALEE HOLLOWAY: ... I have told Prime Minister Oduber that I will do this, I will be the voice of Natalee for the next 40 years. Loving Natalee - Beth Holloway. Page 200: My child. My beautiful daughter. I can't save her. It's too late. Natalee is gone. And second to the great tragedy of losing her is if we fail to learn from what has happened. I could be any parent in the world. And no parent should ever go through this experience. Natalee could be anyone's daughter. And in these thoughts a new path is made clear. There is something I can do. Many people reached out to us, and I can now reach back to them. It might be too late to save Natalee, but it's not too late to save others. And it's time now to make good on my pledge to stand before high-school and college students, law enforcement professinals, victims' rights groups, travelers of all ages, and anyone interested in personal safety to share Natalee's story and our hard lessons, so that others might learn from them. Beth gets it! She comprehends perfectly. 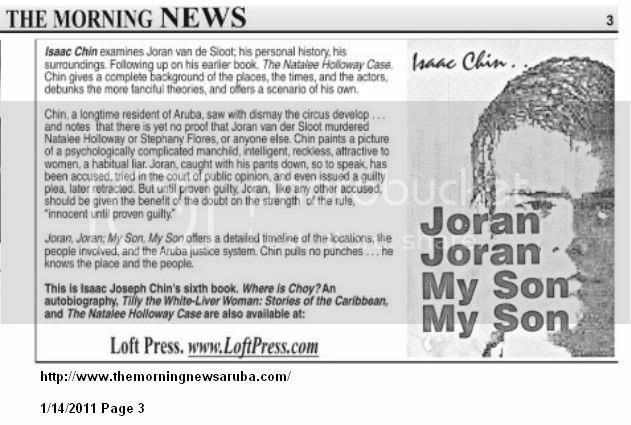 Page 158: Not long after the "criminals speech," some Arubans back off their prayer vigils for Natalee. A few protest in the streets against the barage of negative media. We've worn out our welcom at the Holiday Inn. And they let us know they've had it. 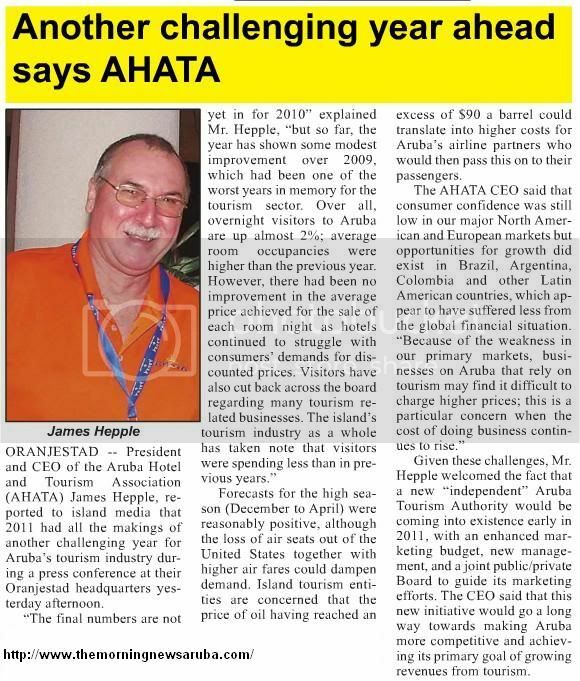 The Aruba Tourism Authority (ATA), the Aruba Hotel and Tourism Association (AHATA), the Aruba Trade and Industry Association and a scattering of island officials establish the Strategic Communications Task Force to combat the negative media. And to combat us. My 27 year old son's lifelong friend is the image of Joran. He is 6' 4" and cannot purchase shoes to fit him in our area. He is forced to cross the line to a specialty store in Bellingham, Washington. The hair style and the beard must be "the look". However ... unlike Joran ... this guy is has a heart of gold and ... is going to be a Daddy in March. The picture doesn't go with that link, right? Congrat's to your son's friend becoming Daddy! To me, becoming a parent has to be the most amazing honor. As far as Joran is concerned... Joran's heart is missing and in it's place is a black hole of darkness. I'm not sure who to ask this question. I have been playing around in my profile and trying change some settings. I was successful in adding a picture so I'm happy about that. I went to one area that talked about "notify" and "Messages". I can't figure out how to use the notify button and can't find it to click on it. I also can't find how to do messages. Am I not seeing something, or is that a feature that I just don't have permissions to do? I had today off so spent more time trying to figure all of this out. My son's friend and lovely wife will make great parents. This guy has spent many hours in my hubby's workshop in the past two months refinishing a maple chest of drawers that has been in his family for generations. You are right. Joran does not possess a conscience ... a heart. It is sad. This young man was raised to believe that the legal and moral boundaries that define a civilized society do not apply to him. He has never learned that not respecting those boundaries ... there are consequences ... there is accountability. 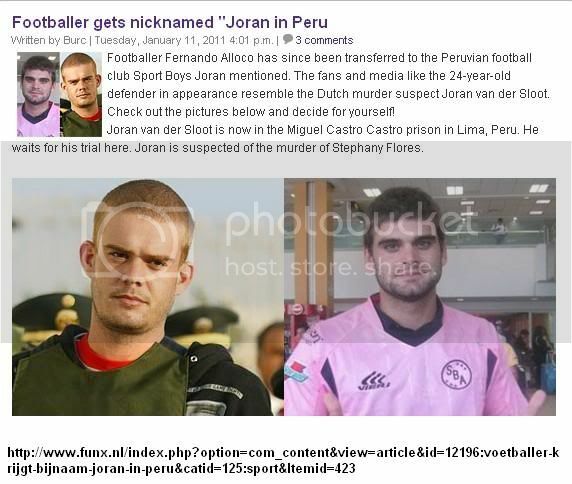 The adults in his life failed Joran big time. Klaas and/or Mods will be able to answer you queries best. I know there is no private messaging or editing options available to Monkeys. PMs or Private Messages are disabled by the Administration. Early on, PMs were found to be troublesome, therefore, they are not used. Editing your posts is also disabled for the same reason. There is a button at the bottom of each post that says Report to Moderator. If you have a problem or question about a particular post, this can be used. Admins & Moderators will get notification and you will get a reply. Usually, that will be Klaasend. I'm sorry you spent so much time trying to figure out the notify and message functions. If I've omitted anything, I am sure another Mod or Klaasend will correct me. Thank you for the response. I thought that I was just not looking in the right place. I will stop looking for those features. I had forgotten to ask about the signatures. Is there a signature field that I am not seeing? That is one last thing that I wondered about. Thanks again for your help.